The day started with smell of bacon, eggs and fresh coffee brewing in the kitchen. We did our morning routines, buzzing around the dorm. We had our showers, packed our lunches and were all ready to get going. Before heading off on our adventures, we gathered to have our morning meeting and discuss the plans for the day with Karen. This really set the tone for the day. We all met at the community school to meet the crews and learn what our jobs would be for the day. Tasks were assigned and we were split into teams. Carolyn, Kim, Olga and myself (V) were working at the home of a local West Virginian couple John & Evelyn. They were very young at heart and an energetic pair in their eighties who were grateful to have us there. John and Evelyn spoke openly about their life and experiences here in West Virginia and were very proud of the home and life they had built together. They were humbled to have so many people care deeply about them and their situation; people who were willing to drive, and fly from various parts of the world to help restore their home. They spoke of how some of their neighbours weren’t very friendly, no offers of help, or even a hello. Lloyd and I (Tania) had the privilege of working with Jesse, a young woman who has just received her G.E.D and her driver’s licence. She very proudly shared her accomplishments with us. Jesse took us around town to feed the children is low-income neighbourhoods. She is a 23-year-old woman who has changed her life around; she now serves her community in need. She shared with us her aspirations in life and how she one day would like to leave this community and spread her wings. After a warm welcome, the team were shown around and quickly got to work with Steve; the site Supervisor and a great group of local guys. 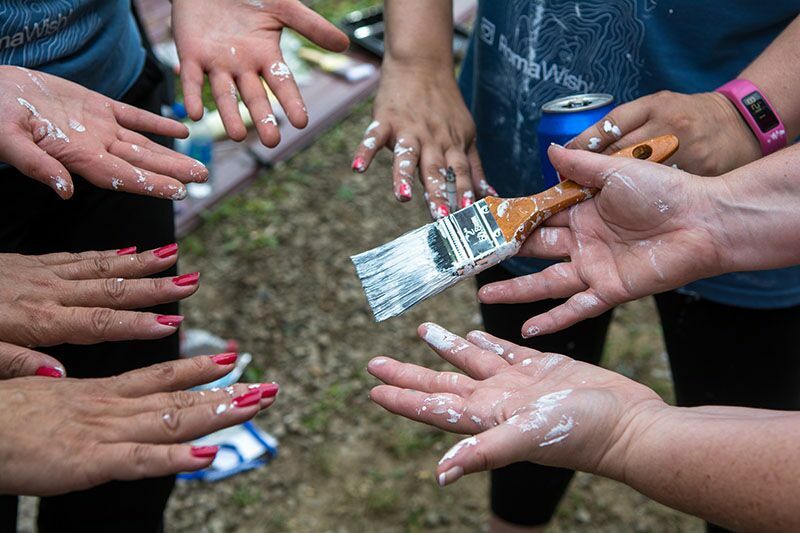 We bonded with the team, and had plenty of laughs as we all worked hard, scraping and painting. The boys shared some of their stories and the girls and I were moved at the candidness. We felt connected with the team through sweat and stories, we were welcomed into their world.